Offering you a complete choice of products which include portable display stand, honeycomb sheet, paper honeycomb, fire door filling material, paper board and door filling material. Compression Strength 1000kg per sq.mtr. Revolutionary design with customized thicknesses from 15-60mm. 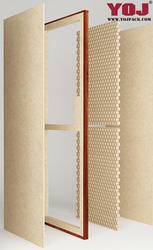 • Honeycomb Core is an excellent core for all types of interior doors by virtue of their high pressure strength. 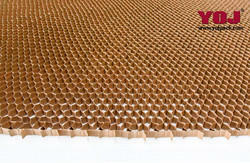 It is an ideal substitute to traditional solid fillings, chipboard strips or tube boards. robust furniture by offering a high strength-to-weight and strength-to-thickness ratios. 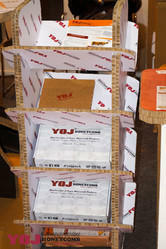 • It is most suitable for furniture pieces that demand high manoeuvrability during transportation and handling. • They can be used in flat doors, moulded doors, steel doors as well as standard hardboard doors. • Paper honeycomb offers unmatched glue bonding with UF, PVA or PUR Hot melt when used between hardboard, MDF, Steel and Melamine facing plates.